Welcome to InMotion Hosting! We're happy you've chosen us for your web hosting needs. We want you to be successful with your website, and we are more than happy to help if you have any questions about creating a new site or moving an existing site to our servers. Already know what you're doing? Just need the technical details? If you're building a new website, one of the first things you'll need to do is decide which software you'll use to create it. We've listed a few of the more popular programs below you can use (click each link for a getting started guide). If you're not sure which software to use, we've recommended a few. These are just a few of the software applications you can easily install onto your hosting account using Softaculous in your cPanel (Control Panel). Feel free to explore and test different software to find the right one for your new website! It's simply impossible to be an expert in all of the 1000's of programs that are available, but we're good at figuring this stuff out - ask us a question if you need some help. If you're interested in learning HTML and more in depth information on web design, we have our Web Design Education Channel you can explore. 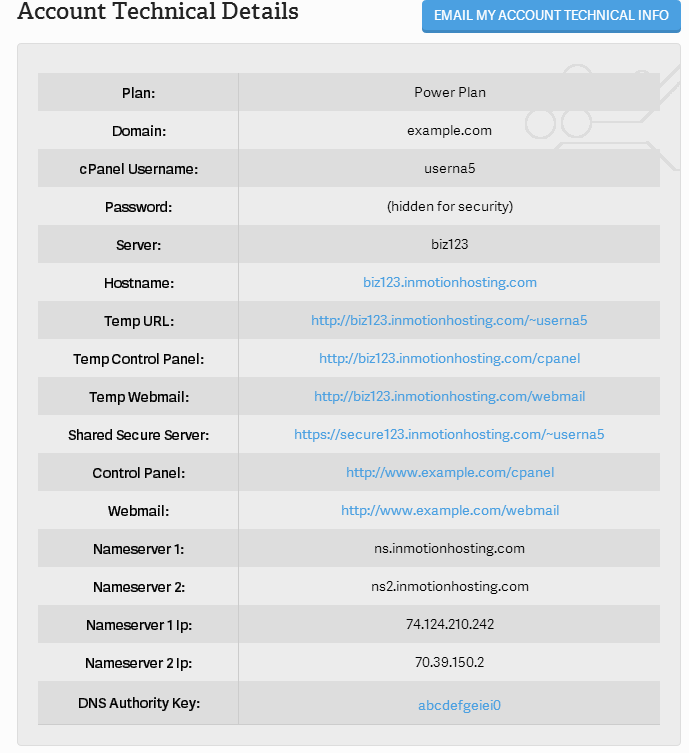 If your previous host uses cPanel, see our article on migrating your website from another host that uses cPanel to InMotion Hosting. If your coming to us from a host that doesn't use cPanel, we have a instructions for making a website move without cPanel too. We assist our customers with moving websites all the time, so we understand some websites are harder to move than others. If you run into any snags along the way, ask us a question! If you'd rather be hands-off, you can submit a website transfer request in AMP. All of our hosting accounts include the ability to manage email accounts. If you consider yourself a beginner, start with our Email Getting Started Guide and Strengthen Email Authentication guide. We also have an extensive library of email-related articles that can be found on the Email articles. Now, there may be some people reading this article who already know how they want to build their site and just need some basic information to start with. To find the technical information, simply click on the Account Technical Details icon within your AMP as shown on the right. Technical information is displayed in a table as below. We cannot stress enough the importance of site backups. With the cPanel Backup Wizard, it's a very easy process. A site backup will be your best friend if something is accidentally changed or deleted in your site and you need to roll back to a working version of your site. Keep in mind too, it's not just about potential errors. If companies like YouTube and Nokia can be hacked; any website could fall victim to an attack. Good backups are your safety net in the event your site is compromised. Please see our article on Backing Up your Cpanel for more information on the importance of, and how easy it is to create a backup of your account. To get a head start on improving security, set up ModSecurity and Hotlink Protection. If you suspect malicious activity on your server, you can submit an account scan ticket request. Also, check out Sucuri for enhanced security. Do you use PHP on your website? Most customers will need to update configuration settings and may need to update PHP settings after a website move. We have helpful guides on updating local PHP settings and working with MySQL databases. If you're transmitting any confidential information through your website, such as credit card details or social security numbers, you'll want to secure this data while it passes through the internet by using an SSL certificate. For information on SSL certificates, please see our article on the difference between free and paid SSL's. You will see articles that refer to Account Management Panel (AMP) and/or cPanel. To make sure you understand the difference, please see our article on AMP vs. cPanel. Some of our more advanced customers may need to update DNS records. Please see our article on making custom DNS records for more information. For Shared Hosting customers, bandwidth is unlimited for all customers. But if you are on a VPS or dedicated server, we do not offer unmetered bandwidth. If you would like to learn more, read about unmetered VPS hosting. Do you have a pedigree format, for an animal site? 1. I have trasnfered my website to inmotion but when I go to my domains, I don't see my site domain listed there. Do I have to transfer the domain of the site i trasnfer? 2. After the site is transfered. How can I acces it for managment? 1. I have transferred my website to InMotion but when I go to my domains, I don't see my site domain listed there. Do I have to transfer the domain of the site i transfer? There are 2 meanings to "transferring a website" - 1)Transferred the domain name and 2)Transferred the website files. Very often, transferring the files can be completed - it's done through a WTR (Website Transfer Request)- but then the domain name is not transferred or directed to the new hosting server. Also, you may want to review the difference between a transfer and a name server change. It sounds more like the site files got transferred but the domain is not pointing to us. Check to see where your domain is pointing (if it didn't transfer). Call our support team if you require further assistance. We will not be able to make changes through the Support Center website if they are needed. 2. After the site is transferred. How can I access it for management? It depends. If you're referring to managing your site by having direct access to the files, then as long as they were transferred to our hosting server you can access them using an FTP client or by using the cPanel File manager. If you're referring to managing the site by using an interface provided with the software you are using, then it will depend on how you have installed your site at our location. If you're using the browser to access the management functions of the website, then that path should be the same if you are using the same domain name and it is now pointing to our hosting service. Otherwise, you will need to adjust your URL (the URL used to access the management functions of the site), based on the new location where you have installed it on our hosting services. If you need further assistance, then I recommend contacting our live technical support team via phone/email/chat. Typically, you would FTP the files up to the Document root of your website. I would like to build a new website that has e-commerce (maybe a total of 6 items sold) and have been considering using Wordpress. Is this a good choice? If not, what would you recommend for a slick looking website that is easy to put together and manage?I'm basically a novice level site builder though I bult my menuink.com site using Expression Web, but I've no experience using the newer programs. I would like the site to take traditional forms of payment (Visa, MC).What would you suggest I use?~ Thank you for the help! WordPress is a fine choice for what you're trying to do. It's easy to manage, it's expandable because of the thousands of free plugins and it's also easy to share management of the website with more than one person. Or, it's possible to pass the site off to another person without having to involve a developer. hi, i got a hosting and domain from you but when i ping the domain name i get an error message. how long does it take to register the domain name on your DNSs? Typically, DNS propagation takes between four and twenty-four hours. Hi. the instructions and information are definitely NOT lay-person friendly! Thank you for contacting us. Sorry to hear you are having difficulties. We are happy to answer any questions you may have here in the Support Forums, or via Live Support. When moving servers, since the IP address changes, you might be experiencing this due to propagation. If the problem lasts longer than 4 - 24 hours, I'd say you need to reach out to support for help. We can see the folder moodledata. The Moodle version is 2.9. I just signed on and have selected Wordpress as my website builder. I have read all the tutorials but still have no clue how to build a website. This is a very unintuitave application. I feel like I need to take a class just to learn it. Trying to get support from InMotion is next to impossible as their chat line always has 30 plus people in front of me and calling their support number says there is an hour wait. I wish there was a video tutorial that ran a step by step process of building a simple website. Arghhh!! I am so frustrated right now. Apologies for the frustration. The problem with using WordPress is that if you already have even a little bit of knowledge of how to create a website, it's not going to gel with what you already know. That is because it has already provided a website framework for you, and limits what you can change in terms of its appearance with its existing interface. HOWEVER, this doesn't mean that it's a bad solution - just one you may need to approach a little differently. And, although it's difficult at the start, you do have full control over the website pages and you can make it look the way you want it after a little bit a learning curve. As writers for the community center, we have been particularly concerned how to best provide guidance on using WordPress since we do support it. We are still in the process of finding the best way to provide guidance on its use. It sounds like you've tried to use some of the guides, but it's not working for you. When I was looking at other tutorials/videos on how to create a WordPress site, I did see a good tutorial to me. It's in video format, and he provides a beautiful theme that he developed. Check out this video tutorial. It's not made by us (you can ignore the whole hosting services part and WordPress installation as it should already be done for you), but it provides you a very friendly way to get your WordPress site created. I hope this helps to , please let us know if you require any further assistance. I have successfully created my first site with Boldgrid which has been great. Now I want to create a second web site using the addon domain option. I can add the domian but the I can not find any icon either on amp or cpanel to start creating/working with the second domain in order to create a web site am I doing something wrong? Or is add on domain not really a way to have a second web site? I am having our development team look into that as this product is still in its beta release. One thing you can do is if you have WordPress installed on your addon domain, just copy the boldgrid plugin from mainsite.com/wp-content/plugins to addonsite.com/wp-content/plugins/ folder. I want to change the main Domain to my another Domain webdesignerada.com instead of ada3d.ch. Coud you please change my main domain to webdesignerada.com that I could create website in Inmotion Hosting? Thank you for contacting us. Since this is just our public forum, we cannot make any changes to your account from here. You can request a primary domain name change from AMP at any time. I may be nice if you could increase the font size of the text content on this website. Or if there is any way to increase the font size myself fo reasy reading please advise. Thank you. Thank you for contacting us. In most browsers you can press the Ctrl key, then turn the wheel on your mouse to zoom in and out. If you tell us what type of browser you are using (such as Chrome, IE, Safari), we can provide more specific steps. I have WordPress installed to build my site and know that woocommerce is a plug-in with WordPress. However, PrestaShop seems to have some stronger shipping support. Can I use PrestaShop with WordPress? If yes, would there be any drawbacks to using it over woocommerce? (PS - My level of web building/management is only at the basic level!) Thanks! Thank you for contacting us. I could not find an up-to-date plugin, or built in way to use PrestaShop with WordPress. This means you would have to host WordPress and PrestaShop in separately, or code/develop a custom solution. I will be transfering a domain of my own that I have on another hosting to inmotionhosting. On that hosting I have severals (about 100 subdomains ) all are wordpress based blogs. What is your recommendation to transfer all of these blogs to inmotionhosting once I had finished the domain transfer? I would suggest trying to perform the steps in the following guide cause if you have us transfer that many websites it would most likely get pretty costly. It appears the files are in html. You can use our articles to help you do almost anything you need such as edit files using the File Manager. You can then simply edit the files right within the cPanel itself. NO idea how to update information on the webpage now that it has been transferred. It is also saying it is hosted by Ipage at the bottom of the website. I do not know HTML or have technical skills. I need some guidance here please. What is your domain so we may take a look at it. If you had your website built in HTML and you do not know HTML then you may need to try and switch to a CMS (Content Management System) such as WordPress or Joomla. Staff: Domain site is www.honorflightsouthernnevada.org. I was a templet that I just had to drop and drag information. I have NO idea how to do anything else. I tried to access the files from the cpanel and it is out of my depth of knowledge. I need to be able to update it in as simple a way as possible. Please help. Hola, tengo un plan energia y me gustaría saber si puedo hospedar dos web distintas con dominios diferentes? Gracias. Thank you for your question. All of our Hosting plans can accommodate at least 2 different websites. Please see our guide on how to Add another domain to your account. It just feels complicated. I'll either call or struggle. Thank you for contacting us, it is not as hard as it seems. To get started just install a web building program using Softaculous. We then have Education channels for the most popular programs. These will help you get your website built. My website stopped working and I cannot find any problems with the code so I am not sure what is wrong. The site is mdjzmilling.com. Any help you can give would appreciated. Sorry to hear that your website is having problems. It appears that you have only a few website files in the PUBLIC_HTML folder. There was a re-named index file and a few other files. The PUBLIC_HTML folder is the location where your website files should exist. I renamed the file to INDEX.HTML (instead of INDEX.HTML_) and a portion of a website now appears. There are no graphic files. You may need to re-load the website or request that backup files be restored. If you think you need the site reloaded, then please submit a request as soon as possible. I hope that helps to get your problem resolved. Please let us know if you still require further assistance. Thank you for your question. Since a Power Plan only includes 1 cPanel, you just have to add the new domain as an Addon domain. If you want to create separate cPanels: VPS, Dedicated, Reseller, and Managed Hosting includes this ability. I have a question relative to more than one website. In order for us to have more than one, do we need to have multiple c-panels or will they function normally as add-ons? Yes, your addon domains will function as individual websites with their own document root. You do not need multiple cPanels. I checked your website and it loads, but it is only showing the default "Coming Soon" page. I recommend reading our Website getting started guide. It will help you get started with building, or transferring a website. I'm so glad you were able to make an informed decision and choose InMotion Hosting. I think you'll find our support staff top notch. If you ever need anything, please feel free to contact me. Thank you very much for these tutorials. We agonized for weeks looking for a hosting service and after talking with your support staff and using your tutorials, I really feel that we have made a good choice.